Katraj to Sinhagad or as we call it “K2S” is a popular monsoon trek for professional trekkers, amateurs and newbie’s. The route starts from the Katraj Tunnel Top (Old), travels through a series of mountains and hills (more than 15) and approximately (16kms.) which leads to the destination the Top of Sinhagad Fort. 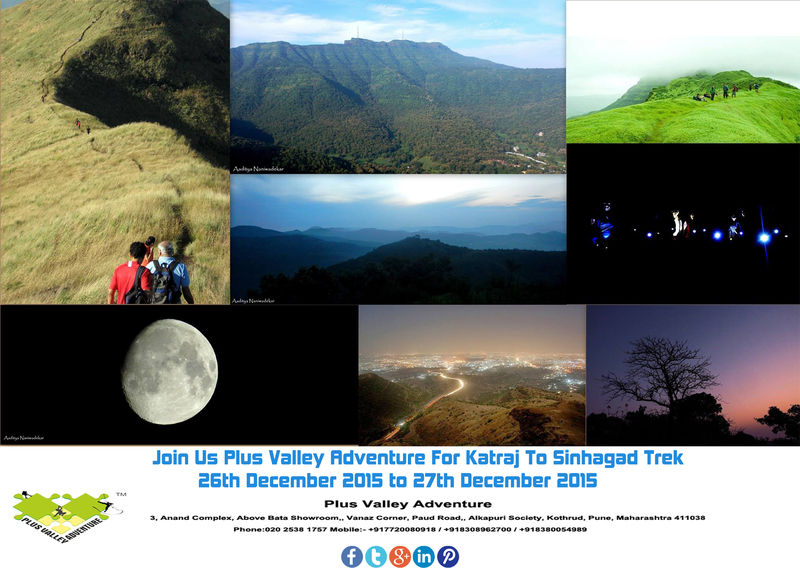 It is definitely a trek which will test your physical fitness, stamina and endurance. The trek ends at Sinhagad. Sinhagad: Sinhagad is a fortress located roughly 30 kilometers southwest of the city of Pune, India. Previously called Kondhana, the fort has been the site of many important battles, most notably the battle of Sinhagad in 1670. It was also strategically located at the centre of a string of other forts such as Rajgad, Purandar and Torna. Perched on an isolated cliff of the Bhuleswar range of the Sahyadri Mountains, it is situated on a hill rising 1312 meters above sea level. Given natural protection by its very steep slopes, the walls and bastions were constructed at only key places; it has two gates – the Kalyan Darwaja in the south-east and the Pune Darwaja in the north-east. Assembly Point – Plus Valley Adventure Office, 3, Anand Complex, Alkapuri Society, Opp. Hotel Kinara, Above Bata Showroom, Vanaz Corner, Paud Road, Kothrud, Pune- 411029. Assembly Time – 08.00 PM. - Complete spare set of clothes. • Travel by Public Transport from Plus Valley Adventure Office to Katraj and Sinhgad to Swargate. • Morning Breakfast and Tea.